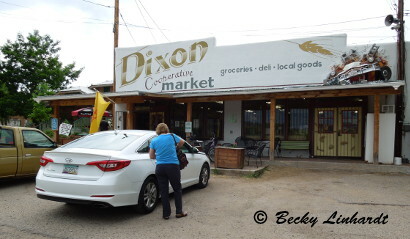 Dixon, New Mexico – Studios, Galleries and more! In the 1970s a few artists and writers found the sleepy little town on Dixon, New Mexico to be to their liking. 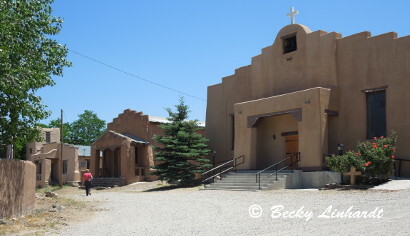 Conveniently located between Taos (30 minutes north) and Santa Fe (1 hour south), it was and remains, comfortably quiet. 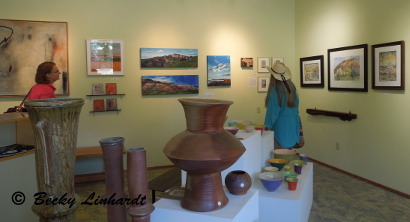 In time, a supportive community evolved of artists, writers, organic farmers, and the longtime residents of the Embudo Valley. The arts are supported at the little school in town. When the local grocery store closed they formed a co-op store. Then in 1982 the community of artists decided to create an event, the Dixon Studio Tour, to promote the businesses of the artists, writers, and a new winery, as well as help fundraising for community organizations in the area. It remains true to its roots, a fully volunteer effort that is scheduled for the first full weekend of November every year. 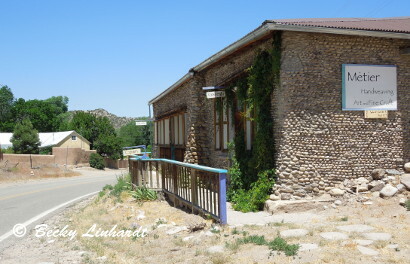 The community supports an historic church, a new library, a new post office, a new clinic, and the Mission Embudo Community Hall. There are now two wineries. Near the center of town Zuly’s Restaurant has a shaded patio and the menu offers an optional egg on top of the enchilada – true New Mexican style. 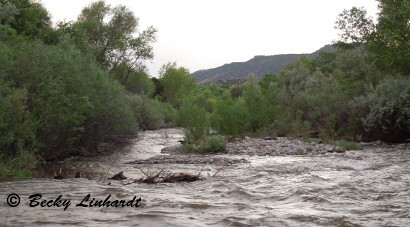 The life blood of this high desert community is the Embudo River, flowing fast in the spring as the snow melts in the mountains to the northeast. Regulating the flow in the dry months, a series of acequias have historic beginnings tracing back to Spanish land grant times. 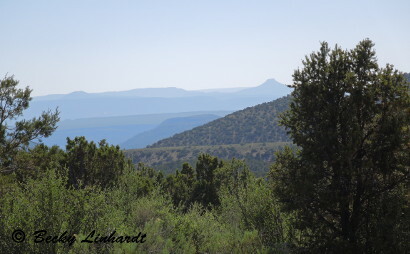 During past visits to New Mexico I found that I only like scrubby, rocky landscapes as seen from a distance. I need real trees nearby. 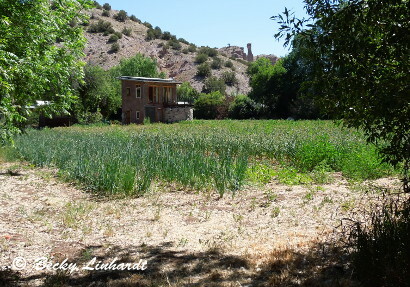 Staying at the El Bosque Garlic Farm in early June I had the rich green of Embudo Valley Cottonwood trees and the sound of rushing water from the annual mountain snow-melt. 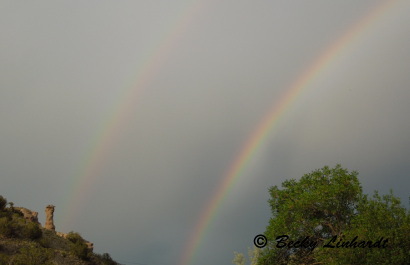 Rain one evening provided a double rainbow above the trees. 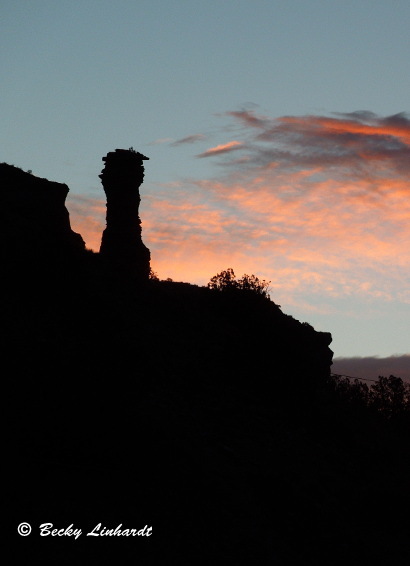 A brilliantly colored sky at sunrise one morning silhouetted the hoodoo on the hill. 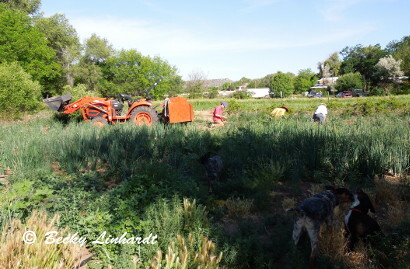 Later, but still early morning, I watched and then talked with owner Stan Crawford and two interns working a harvest of rows of organically grown garlic. And no, we never experienced a garlicky smell anywhere nearby. 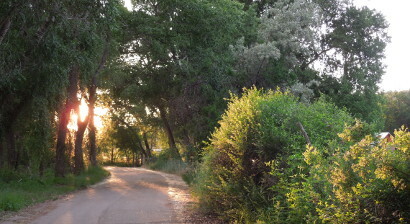 Using the Tower Guest House as our base, we visited Taos and Santa Fe then returned to enjoy a quiet walk along the country road that follows the Embudo River on its north side. We visited businesses in Dixon on Saturday, when some of the galleries have regular hours including Rift Gallery on NM 68 and Globe and Metier Galleries on NM 75 in the center of town before having lunch on the patio at Zuly’s. Exploring the area, we drove NM 75 up into the mountains one afternoon and were quickly into forests of pine trees, then meadows and farms near Penasco and Rodarte. Remembering that pleasant drive, returning from our last trip into Taos, we chose to avoid busy NM 68 and traveled a back route to NM 75 for our return to Dixon. Gorgeous scenery.